The Faro’s of Galicia are an impressive site scattered along the Galician Coast. The breathtaking scenery of the varied coastline leads the soul to ponder and reflect on the immenseness of life and the ocean. In the Costa Da Muerte known as “The Dead Coast” because of the dangerous seas and jagged rocks that claimed so many ships and lives taking them deep into the silent waters we witness both its peaceful beauty in contrast with its incredible natural power and force. Finis Terrae or as it is known in Gallego Fisterra “The End of The World” one can imagine how it came to be named in looking at the picture for the vastness of the ocean just beyond the cliffs looks to go on forever. A truly magical and inspiring place that has been a most important symbolic camino site for millions of pilgrims, a tradition for many, to reflect on their camino journey’s and the adventure that awaits them upon leaving. Many will return as the Camino Call is hard to let go after you have answered it once it remains inside you having forever transformed your soul and your life! “I am alone and impenetrable I watch the navigators intentions in silence as they stare back at me in their uncertain course to reach the far away port when they come to visit me in Finis Terrae”. 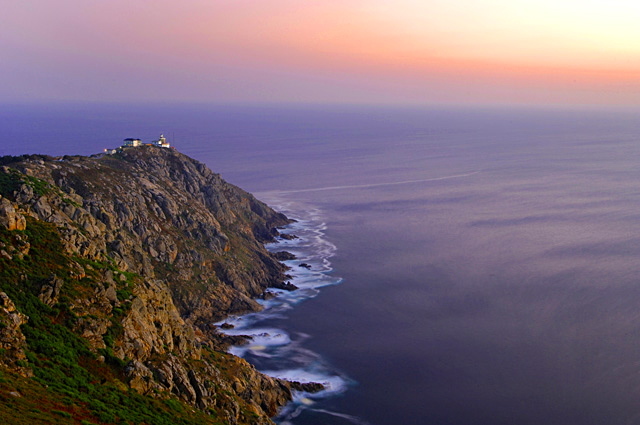 Fisterra Lighthouse, A Caruña Province. This entry was posted in Camino Treasures and tagged camino, Camino Stories, faro's, fisterra, history, lighthouse's, nature, outdoors, The Way, traditions. Bookmark the permalink.